West Boca Self Storage is a premier Self Storage operator in West Boca Raton Florida. West Boca Self Storage is a State-Of-The-Art Self Storage facility. 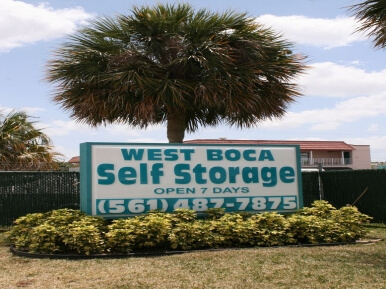 West Boca Self Storage offers Self Storage units of all sizes with attractive features such as climate control, RV parking spaces, electronic gate access, and month-to-month leases. A full line of boxes and packing supplies is also available at each one of our locations. Typical office hours are 9:00 AM until 6:00 PM with our friendly and professional staff ready to help you! With available units and amazing move-in specials, let West Boca Self Storage be your home for all of your Self Storage needs! Stop by today!